School can be a special sort of nightmare for LGBTQ youth, who are sometimes targets of verbal or physical harassment with nowhere to turn for support. No Sanctuary tells the inspiring story of a mostly unseen rescue attempt by a small group of teachers who led the push to make schools safer for these at-risk students. Their efforts became the blueprint for Massachusetts’s education policy and a nationwide movement, resulting in one of the most successful and far-reaching school reform efforts in recent times. 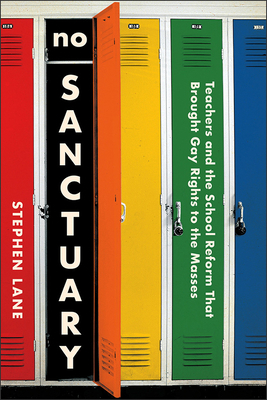 Stephen Lane sheds light on this largely overlooked but critical series of reforms, placing the Safe Schools movement within the context of the larger gay rights movement and highlighting its key role in fostering greater acceptance of LGBTQ individuals throughout society. STEPHEN LANE is a high school teacher. He lives in Concord, Massachusetts, with his wife and son.